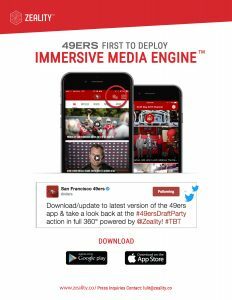 SAN FRANCISCO, June 6, 2017 /PRNewswire/ — The San Francisco 49ers has officially deployed Zeality’s patent pending Immersive Media Engine™ (IME) in the latest version of their mobile app. Besides live scores and statistics, behind-the-scenes videos, live programming and podcasts, the 49ers app now supports viewing 360° videos and recording reaction videos using Re/Lives™. “Zeality is revolutionizing how we get closer to our fans. Their technology is not only changing how we engage with fans but changing the longevity of our content,” said Rob Alberino, the Vice President / Executive Producer at San Francisco 49ers. This new functionality in their app will bring fans up close and personal to the 49ers, Levi’s Stadium, and how fans feel at an actual game. Viewers can be taken to the center of the experiences, virtually running onto the field with the players before a game or go behind the scenes at the 2017 Draft Day Party. The Zeality Re/Lives™ technology will enable fans to record and share their viewing perspective and reactions within 360° and VR content. 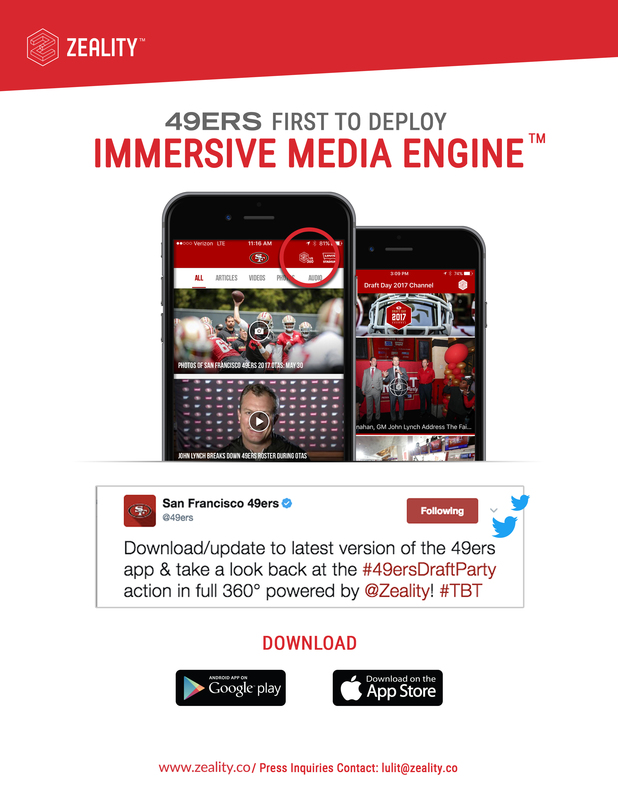 “We couldn’t be more proud and excited to see our IME™ live in the latest version of the 49ers app,” Zeality’s co-founder and CEO Dipak M. Patel stated, “We are looking forward to the next update coming soon which will expand the capabilities to support 360 photos as well.” In addition to the technology, the Zeality content strategy team is dedicated to supporting and educating clients like the San Francisco 49ers to produce scalable VR content driving repeat views and longer sessions of engagement per viewer. They also help develop comprehensive adoption models to guarantee maximum value for fans. Download the latest version of the San Francisco 49ers app today here on iOs App Store and Google Play Store to get the full experience today. The Zeality Immersive Media Engine™ (IME) is a suite of tools to help media driven organizations seamlessly integrate Immersive Media (VR, 360° photos, and videos) experiences into their own iOS and Android applications. The core of the Immersive Media Engine™ consists of a number innovative and viral features built upon a robust cloud platform. Zeality’s core services include uploading, hosting, video transcoding, adaptive bitrate streaming, and featuring content. In addition to its core services, the IME includes a number of revolutionary features, including Re/Lives™, the Zeality 360° player, and sharing capabilities. All of these features are designed to bring additional value to your content and deepen engagement with your audiences. The IME is customizable, flexible, easy to integrate, and co-exists with other SDKs in your applications. In addition to its robust feature set, the IME leverages an easy to use Management Console, where content creators and publishers can upload and manage their content, view metrics, create campaigns and methods of monetization all in our easy and intuitive interface. The IME’s built-in rules engine enables our customers to manage the publishing, curating and control access of their content. The Immersive Media Engine is available now., For more information, please visit the company’s website at www.zeality.co.